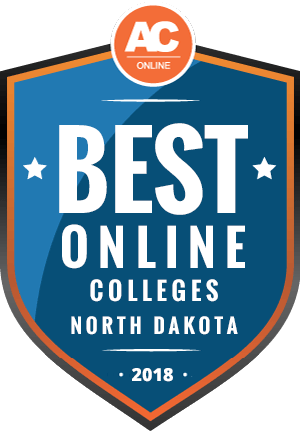 Why Choose North Dakota for Online Higher Education? Today, more employers require a college-level education from their employees. In North Dakota, jobs requiring a postsecondary education will rise to 72% by the year 2020; careers mandating a minimum of a bachelor’s degree will increase to 24%. This guide details the specifics of earning a degree in North Dakota and explains the needs of the state’s economy. Both in-state and out-of-state students should consider North Dakota higher education, as its affordability and flexibility meet individual student needs. We’ve ranked these online schools in North Dakota according to a series of quantitative and qualitative metrics, such as accreditation status, degree options, student-teacher ratio, job placement services, and graduation rates. Our metrics focus on the affordability of each school’s programs compared to the value of the education received. North Dakota offers several online college degrees, 28 of which function completely online with no on-campus requirements. Almost 9,000 students are currently enrolled in fully online undergraduate- and graduate-level programs in the state. These distance education programs benefit students who work full time, individuals who work in shrinking labor-based industries, and parents who raise their children alone. When considering a school, look at the cost of in-state vs. out-of-state tuition. In North Dakota, out-of-state tuition is, on average, more expensive than attending in state. That said, many online programs offer lower tuition to out-of-state learners. Additionally, it is common for schools in neighboring states to be part of reciprocity agreements, allowing students from participating states to receive in-state tuition at an array of out-of-state schools. Reciprocity agreements vary by state and will be addressed more thoroughly below. According to the NCES, North Dakota’s cost of tuition for in-state and out-of-state tuition resembles the national average. The cost of tuition also depends on whether a school is public or private and what degrees it offers. Two-year vocational schools, for example, will cost less per credit than a private, four-year undergraduate or graduate institution. The examples below represent current tuition rates at colleges and universities in North Dakota. Nonresident students looking to earn an online degree in North Dakota need to consider various factors: in-state vs. out-of-state tuition, reciprocity agreements, and attendance restrictions for distance learners. The chart below details the 2016 IPEDS data for students attending online programs out of state. Participating “good neighbor” states commonly offer students tuition breaks. States with such agreements are often broken into regional interstate compacts, or groups of states with reciprocity agreements. North Dakota schools, for example, partner with Illinois, Iowa, Kansas, Michigan, Minnesota, Missouri, Nebraska, Ohio, South Dakota, and Wisconsin as members of the Midwestern Higher Education Compact (MHEC). The MHEC improves access to higher education through the Midwest Student Exchange Program (MSEP). Established in 1994, the MSEP assures affordable access to higher education. Under the MSEP, public schools agree to charge no more than 150% of in-state tuition to out-of-state students. Like traditional on-campus programs, online degrees must uphold a certain standard of education to be accredited. For any program, online or on-campus, colleges must be approved by the North Dakota State Board of Higher Education. As each state may have different standards of education, all schools participating in a reciprocity agreements must be authorized by the National Council for State Authorization Reciprocity Agreements (NC-SARA). This section answers common questions from prospective students selecting a college program. Consider your potential schools from all angles, making sure the answers below apply favorably toward your program of choice. Do online credits cost more or less in North Dakota? The cost of online tuition varies depending on the tuition rates of the school. On average, tuition in North Dakota equates to or is lower than tuition in other states. As North Dakota is a member of the MHEC, tuition for out-of-state students looking to complete an online program in the state will be able to attend for in-state tuition, or close to it. Traditionally, distance learning is more affordable per credit than traditional on-campus education, both in price per credit hour and in associated costs, such as housing, textbooks, and lab fees. Distance learners in North Dakota and other MHEC member states can complete their online education for an average of $200 per credit hour. Which North Dakota schools accept the most transfer credits? Most nationally or regionally accredited schools will accept transfer credit from other accredited institutions, but see if any stipulations exist. In addition to transferring directly to the school, students often seek to apply credits from a two-year college or vocational school to a four-year undergraduate program. Typically, public schools are willing to accept more credits from transfer students than private institutions. For example, large schools such as the University of Mary and Minot State university will accept up to 60 credits, while small schools, such as the University of Jamestown, evaluate transfer applications on a case-by-case basis. Through the North Dakota University System (NDUS), students attending an online college in North Dakota find many options for transferring credits. The General Education Requirements Transfer Agreement (GERTA) allows students to apply general education credits to any other North Dakota four-year school. Through articulation agreements between online universities in North Dakota, students may also transfer credits to schools in other participating states, such as Illinois, Minnesota, or Wisconsin. Will any online colleges in North Dakota accept a GED? Many online schools in North Dakota consider students with a GED for admission. To apply for a GED, a student does not necessarily need to have completed previous study or prerequisite coursework, though adult learning centers across the state offer prep courses. To enroll for any GED testing, applicants must be at least 16 years old; most online universities in North Dakota require students to be at least 18. Students with their GED undergo testing to prove their competency in four primary academic fields: computer literacy, keyboarding, college readiness, and career orientation. While not all colleges accept applications from students with a GED in place of a high school diploma, most institutions, such as the University of North Dakota, consider students with a GED score of at least 145 to be considered college-ready. How many academic terms per year do online colleges in North Dakota offer? Online students often have the option to begin their program at multiple start dates throughout the year. By necessity, traditional on-campus classes are structured with one start date per term. While some online programs follow cohort models, requiring all students to begin instruction at once, many online degrees in North Dakota provide asynchronous courses, which can be completed at any time, students still receive instruction from professors, but specified student-faculty interaction is limited. Distance learners should also see if their asynchronous program can be accelerated; often, multiple start dates allow students to complete a larger course load, thus completing their degree more quickly. Many online schools in North Dakota, such as the University of North Dakota, Minot State University, Bismarck State College, and North Dakota State University, offer online courses with multiple start dates throughout each term. However, note that some programs require more interaction between students and faculty than others. Such programs may not have as much flexibility. Which online colleges in North Dakota will accept the FAFSA? Most public and private schools in North Dakota accept the Free Application for Federal Student Aid (FAFSA). Students in need of financial aid should fill out their FAFSA application annually to determine their eligibility for federal financial support. To be eligible for FAFSA, students must be a U.S. citizen, be seeking higher education, and have obtained either a high school diploma or GED. Aid money is granted in terms of loans, scholarships, research grants, and through work-study programs. The FAFSA differs from a College Scholarship Service (CSS) profile. Many schools accept both the FAFSA and CSS, but almost all online colleges in North Dakota accept one or the other. Are there any free online classes I can take from North Dakota colleges? Unlike attending classes on-campus, online courses do not often have the flexibility for “sitting in.” It is common for large colleges to allow non-students to sit in on lectures and class discussions, even going so far as to contribute to the lesson. Online classes, alternatively, require students to purchase a login in order to access lectures and other course materials. Distance students must be assigned a username and password to take part in any classwork. In some cases, students may attend a sample of an online course available on a school’s website. These sample courses often include lectures and assignment examples, but are created with the intent of garnering a potential student’s interest in the program. Any course materials completed without being an officially enrolled student will not count toward any degree, nor will the time be applicable as transfer credit to any accredited institution. How can I find the online program options at North Dakota colleges? Look into your school’s FAQ page and the North Dakota University System (NDUS), which covers topics relating to colleges and universities, academics, applications, and the state board of education. Students can find answers to questions about scholarship opportunities, academic support, applications for transfer, career training, and articulation agreements. On the NDUS site, students can also find information regarding internships and professional organizations available in North Dakota and neighboring states. In addition to the previously discussed FAFSA, several scholarships for students completing an online degree in North Dakota exist. Students may seek scholarships and financial aid from their school or community; they may also apply for a Pell Grant. See the list below for potential scholarships available to students completing an online program in North Dakota. Awarded by the North Dakota Legislature, this scholarship targets high school seniors looking to pursue a college degree in North Dakota. University students also qualify to receive funds as long as they are enrolled full time and seeking a degree in technology. Applicants must maintain a high school GPA of at least 3.0 and a college GPA of 2.75 or higher. Scholarship Amount: Up to $6,000 total. Applicants must be residents of North Dakota and members of a recognized Indian tribe. To apply, students must be accepted into an accredited program for higher education or a verified vocational program. Scholarship awards are based on need as well as merit. Scholarship Amount: Up to $2,000 per year. To apply, students must be North Dakota residents enrolled in a two-year or four-year higher education program in North Dakota. Applicants must rank in the 95th percentile of ACT scorers in the year of their scholarship application. Students receive scholarships in descending order until funds are exhausted. Students living in any MGMA section states, Indiana, Iowa, Minnesota, Ohio, or Wisconsin, and seeking an undergraduate or graduate degree in the medical field may apply for this scholarship. Eligible degrees include public health, healthcare administration, medicine, and business.